Serve this luscious sauce warm with ice cream or pancakes, or cold with panna cotta, crème brûlée or vanilla cream pie. Place the orange zest, vanilla pod, sugar and 200ml water in a wide saucepan. Set over a low heat and slowly dissolve the sugar, stirring occasionally, to form a thin syrup. Wash the rhubarb. Its leaves are poisonous, so make sure that they are discarded. Cut the stems into 2cm chunks and add a single layer to the hot syrup. Poach for about 4 minutes, turning once, until the fruit is soft but not mushy. With a slotted spoon, remove and place to one side. 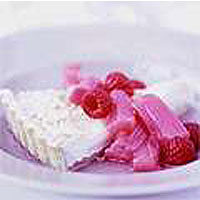 Cook the remaining rhubarb in the same way. Once all the rhubarb is cooked, boil the syrup until it thickens. Remove the vanilla pod and orange zest, return the rhubarb and gently reheat. Add the raspberries. Once hot, serve straight away, or leave to cool.